With Halloween about a month away, my apologies if the mere mention of Christmas induces a groan. But next week marks the beginning of the fourth and final fiscal quarter of the year... and that inevitably means holiday chatter. Whether you're practicing your best Grinch impression or joyfully anticipating Michael Bublé's return from hibernation, the Ghost of Christmas Past has an important public service announcement. 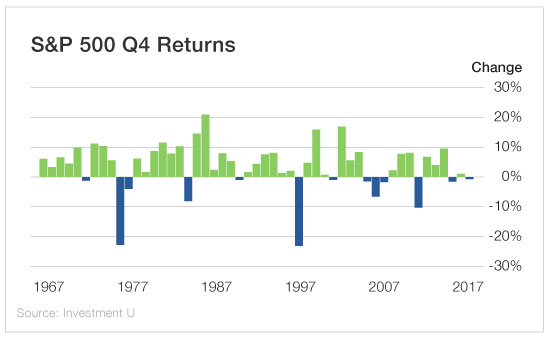 The chart above shows that 38 of the previous 50 fourth quarter returns for the S&P 500 have been positive. That bodes well for the seemingly endless bull market run we're in... especially considering the S&P is on the cusp of a double-digit increase year to date. As we enter what's typically the three best months of the fiscal year for the Dow and the S&P, for some companies - especially in the retail sector - more than 40% of revenue will come during the final 45 days. So what can we glean from the Ghost of Christmas Future? Malls may be losing steam, but traditional brick-and-mortar retailers like Macy's still bring in lots of Q4 cash. And the savvy shareholder can still be rewarded with some short-term gains in this sector. Even the mall-averse type need to buy Grammy and Pap Pap a little something for the holidays. To cater to this segment, most retailers have long since been pivoting toward delivering an online shopping experience. That's where a transportation company like United Parcel Service (NYSE: UPS) comes in. Like Macy's, UPS also gets its hands on a quarterly revenue boon at the end of the year. To hammer home the good news, U.S. consumer confidence unexpectedly rose in September, according to global research by The Conference Board. The recently released figures put the index close to levels not seen since 2000. The bottom line is current market conditions remain favorable thanks to a strong economy and robust job growth - both harbingers of further good news. If this wasn't a rosy enough forecast for you, there's also good news waiting on the other side of the world. The trade war hasn't been very friendly to the Chinese economy. Chinese electric vehicle maker NIO (NYSE: NIO) had an underwhelming IPO this month. Video streaming service iQIYI (NYSE: IQ) has seen a mixed year. And e-commerce titan Alibaba (NYSE: BABA) has been on a mostly downward trajectory for the past three months. But Q4 is a pretty big deal in China too. The consumer buying frenzy that Black Friday and Cyber Monday trigger in the U.S. doesn't hold a candle to China's Singles Day. The November 11 holiday (which doubles as both a celebration of being single and in a relationship) has become the largest shopping day in the world. Consumers spent upward of $25.4 billion on Alibaba alone during last year's celebration. As we head into the holiday season knowing all of this, there's reason to believe we're on track for this rally to continue. Teddy bulls all around!